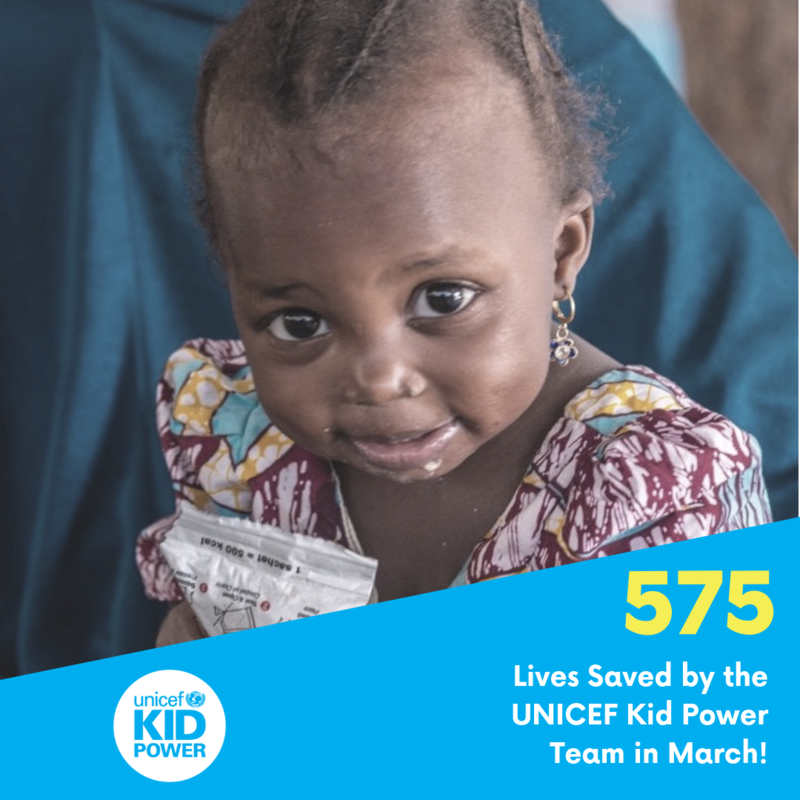 In March, the UNICEF Kid Power team made its biggest impact this school year and, with the help of new teachers, will make even more impact in April and May. The team set a new high for this school year by unlocking more than 86,000 packets of RUTF. This “miracle food” will help save the lives of over 575 severely malnourished children. More than 3,000 classrooms reaching over 150,000 students teamed up in March to make this real-world impact. A Bigger, Active Team Can Make Bigger Real-World Impact! Our team is getting bigger, but we want to reach every classroom in the U.S. so we can make the biggest real-world impact. We can only do that with your help! 1. Play at least one Kid Power Up each week. The surest way to make impact is to take 5 minutes in your classroom each week to complete at least one Kid Power Up. If you’re already doing that, play two Kid Power Ups each week. There are enough videos in your Dashboard to play a new video every day from now until the end of the school year! 2. Refer other teachers to do Kid Power Ups. If we’re going to reach other classrooms, then we need your help getting other teachers to sign-up for this free program. Take 30 seconds now to Refer a Teacher in your Dashboard. (Scroll to bottom of your Dashboard.) Better yet, refer five or even 10 teachers. Tell all the teachers at your school how they’re missing out on using our free program to empower their students. It’s a fact! If we can expand our team and/or if you can play more Kid Power Ups in April, we will make even bigger impact! What do you think? Can you help us unlock more than 100,000 packets of RUTF? Share Kid Power with your colleagues and press PLAY for impact now! If you’re not already a part of UNICEF Kid Power, you can join for free anytime. It gives kids the power to save lives by connecting their activity (doing Kid Power Ups) to real-world impact. Sign up here!